Before: the Oil Jetty, photographed in November, 2002. After: detail of an image by hiker56 showing the site of the former Oil Jetty after its removal by the State of Utah (at Dia's behest? who knows; see below) in 2005. UPDATE February 21: regarding my own and others' skepticism regarding the framing of Spiral Jetty's status in face of the proposed drilling, here is some food for thought: a few excerpts from Smithson's writings on Spiral Jetty.... lest we forget what he was all about. 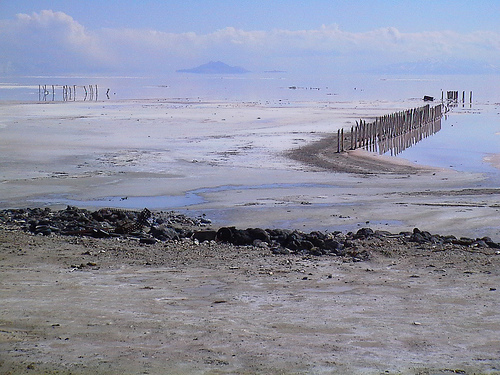 For nearly three decades, Robert Smithson's "Spiral Jetty" lay underwater in the Great Salt Lake. Since 1999, as drought has lowered the water level, this famous American earth sculpture — a 1,500-foot coil of black basalt — has slowly re-emerged. Now it is completely exposed; the rocks encrusted with white salt crystals are surrounded by shallow pink water in what looks like a vast snow field. In 1970, when Smithson built the "Jetty," which is considered his masterpiece, the giant black coil contrasted starkly with the dark pink water of the lake. But time and nature have left their marks. "The spiral is not as dramatic as when it was first built," said Michael Govan, the director of the Dia Art Foundation in New York City, which owns the work. "The 'Jetty' is being submerged in a sea of salt." To ensure that "Spiral Jetty" is accessible to future generations, the Dia, which exhibits and preserves art made since the 1960s, has discussed raising it by adding more rocks. The Dia is also studying whether nature will restore the contrast the "Jetty" originally had with its surroundings by dissolving some of the salt crystals when the lake's waters rise, or whether the foundation needs to do something more. "When refurbishing earthworks, you don't want to create a Tussaud's wax sculpture," said Robert Storr, a former senior curator at the Museum of Modern Art in New York and a professor at the New York University Institute of Fine Arts. "Earthworks were not made to last forever. There is a danger when restoring them to make a more perfect thing than was originally done." Smithson built "Spiral Jetty" at a site called Rozel Point on the northeast shore because he liked the dark pink color of the water, an effect that results primarily from bacteria and algae that grow there. Rozel Point is about 100 miles northwest of Salt Lake City, on state-owned land accessible by a 15-mile dirt road with giant potholes that can trap small cars; four-wheel drive is recommended. 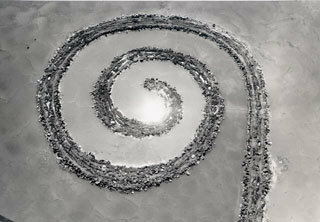 Smithson's estate donated "Spiral Jetty" to the Dia in 1999 when the piece was first emerging. When Robert Smithson's spiral jetty was engulfed by the rising waters of Utah's great salt lake, no one expected to see it again. Now the remarkable earthwork has re-emerged, bringing to the surface a spectacular ring of crystalline boulders, crowds of fans and the rather pressing problem of how to stop it disappearing again. Stuart Husband gets caught between a rock and a hard place. [...] under a sign at the site saying 'Spiral Jetty - End of Road' someone has scrawled 'and the beginning of bliss' and there are numerous cans of Red Bull and Budweiser scattered around as evidence of bonfires on the foreshore. It all worries Hikmet Loe, a Salt Lake City librarian who wrote her master's thesis on the earthwork and who keeps a proprietorial eye on it for Dia. 'I went out there last summer and there were people having picnics on the foreshore and running between the coils, kicking up stones,' she shudders. 'Dogs were racing around out there. Spiral Jetty rising, November 2002. Photo: Joy Garnett, 2002. Some rights reserved. The most famous work of American art that almost nobody has ever seen in the flesh is Robert Smithson's ''Spiral Jetty'': 6,650 tons of black basalt and earth in the shape of a gigantic coil, 1,500 feet long, projecting into the remote shallows of the Great Salt Lake in Utah, where the water is rosé red from algae. The sculpture became an icon immediately after Smithson finished it in 1970. He made a film about it, enhancing the myth: trucks and loaders moving rocks like dinosaurs lumbering across a prehistoric panorama; the modern artist as primordial designer. Smithson anticipated that the lake would rise and fall, the residue of salt crystals causing the black rocks to glisten white whenever the water level dropped. But he miscalculated. ''Spiral Jetty'' was visible for about two years, then became submerged and stayed that way except for a few brief reappearances. With the drought in the West, however, the water in the lake has dropped to its lowest level in many years, and so the jetty has emerged, a brackish Brigadoon. [...] ''Spiral Jetty,'' now watched over by the Dia Art Foundation, is about as remote as a sculpture can be within the contiguous United States. When Smithson found the site, the nearby shoreline was littered by an old pier, a couple of decaying prospectors' shacks and a few small, rusty oil rigs, to which he was not aesthetically averse. Those old shacks and rigs are mostly gone, leaving just dry desert and rocky nothingness until the nearest sign of civilization, 16 miles away, the Golden Spike Monument, where the east and west ends of the transcontinental railroad met up in 1869. To drive from the monument to the jetty is a long, bumpy ride on unmarked dirt and gravel roads through a wide valley that spills down to the lake. A small but steady flow of hopeful devotees make the trek each year, supplied at the monument with a crude map, a stiff warning to bring water and gas and instructions to let park rangers know if the sculpture is visible. Late this summer, a visitor announced that it was. Beyond a stretch of sagebrush and driftwood, boulders encrusted white with salt could suddenly be seen poking up from the lake to the far edge of the spiral, where the water fades toward pink. From the shore, its base was visible beneath the waves. The best-known view has always been from the air: looked down on, it is like a watery Romantic ruin, a line in the land, a snail shell or whirlpool, improbably huge and elegant, its stones lapped by waves. Smithson first conceived it as less of a coil. His wife, the artist Nancy Holt, remembers him wading in hip-high boots, his face crusted with salt, staking the shape out with posts and string, then clambering up to look at it from a rise on the shore. Now it is a sculpture and tourist attraction for the art cognoscenti once again, risen like a modern Atlantis. 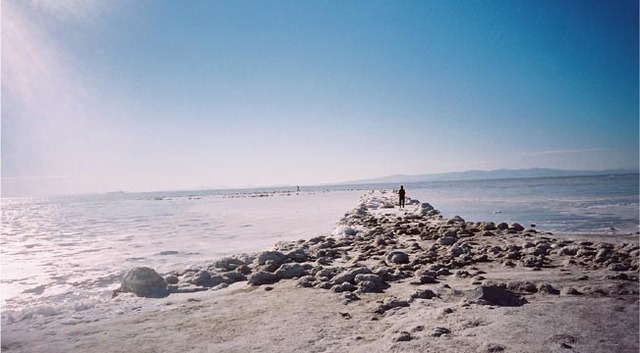 New York, NY—Robert Smithson's Spiral Jetty (1970) is threatened by an application to drill exploratory boreholes in Utah's Great Salt Lake for oil exploration by Pearl Montana Exploration & Production. Dia Art Foundation adamantly opposes this proposed oil drilling as it will endanger one of the most widely recognized and cherished American sculptures of the late twentieth century. Robert Smithson's Spiral Jetty is perhaps the most iconic example of Land Art in the world. Dia acquired the Spiral Jetty as a gift from the artist's Estate in 1999 and today oversees its long-term preservation, including the protection of the surrounding environment. Dia strenuously objects to the proposed drilling which will occur less than 5 miles away from the Jetty. The drilling itself, and potential subsequent oil extraction, will disrupt the viewshed and the area's isolated character, and will degrade the natural environment of the lake by introducing barges with large-scale drilling equipment. Moreover, construction and operation will introduce toxins and chemicals to the delicate saline water and wetlands that surround the lake. In the case of a toxic spill, the proposed operation would cause irreparable damage to the lake environment and threaten the physical integrity of Smithson's extraordinary sculpture. Additionally, Dia is concerned about increased traffic and heavy transport on the rural road that leads to the Spiral Jetty through Golden Spike National Monument, and the potential for noise pollution from drilling and operations.